The Matchup: It’s nearly impossible not to get hyped for this one. It’s Homecoming Weekend on Grymes Hill as two of the top-three teams in the NEC preseason coaches’ poll will clash in the first league game of the season, and the only one on the Week 5 docket. 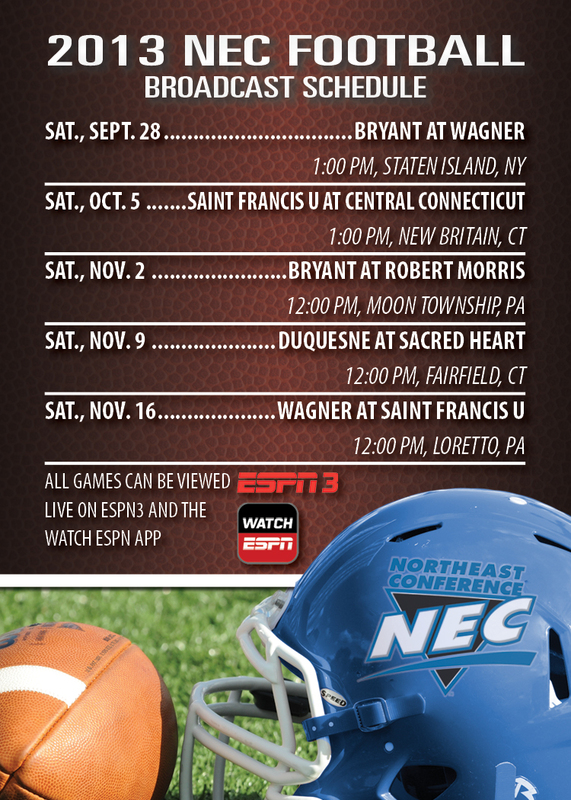 In addition to the 2013 conference schedule, the game kicks off the NEC’s five-week ESPN3 on-air package. Wagner (1-3), the defending champion and 2013 NEC preseason favorite, enters having lost three in a row. Bryant (2-1) comes off a bye week with its lone loss coming at CAA member Maine. Viewers will have a chance to watch two of the top offensive playmakers in Division I FCS – the nation’s active career receiving leader (Bryant’s Jordan Harris) and the fifth-ranked active rushing leader (Wagner’s Dom Williams). The Matchup: Saint Francis faces a nationally-ranked FCS opponent for the third time in four weeks, but this time, the Flash will play the game within the friendly confines of DeGol Field. In a clash of Franciscans and Jesuits, the Red Flash host a Fordham team that has already defeated Villanova and FCS member Temple. Saint Francis’ defense will have its hands full trying to contain an offense that averages 40.0 points and 476 yards of total offense per game. The Red Flash can keep the ball out of Fordham’s hands by employing an effective ground game. Senior running back Kyle Harbridge has reached the 100-yard rushing mark in each of the season’s first three games. The Matchup: Sacred Heart (4-0) takes the NEC’s lone undefeated record out to Patriot League member Bucknell. Both teams have a win over Marist this season, but the latter has only played two games to date. The Pioneers sit in fifth place on the National FCS leader board in rushing offense (306.5 ypg), while also boasting the nation’s fourth-ranked rushing defense (54.8 ypg allowed). That recipe has already helped Mark Nofri’s team to a road win over Patriot League member Lafayette. Let’s see if it works at Bucknell. The Matchup: Central Connecticut faces a CAA member on the road for the second time in two weeks and the third time this season. The Blue Devils enter off an emotional last-minute victory over Albany. Rhode Island has lost 16 of its last 17 games with the lone win in that span coming at Albany in Week 3. Rhody is averaging only 11.4 points per game and has been shut out twice. The Blue Devils will look to continue the progress they made on the defensive side of the ball last week, while keeping RB Rob Hollomon (205 yards from scrimmage last week) rolling. The Matchup: Robert Morris returns to action at VMI following a Week 4 bye. The Colonials are 15-6-1 all-time when playing after a bye week, including 15-5-1 in the regular season, but have dropped their only two previous meetings with the Keydets. RMU will face a team that has already suffered two shutouts this season albeit to two formidable opponents (Richmond & Virginia). Smell football in the air! Saturday morning, gotta love it! Your #NECpride can earn you a ticket to NEC Basketball “Social” Media Day. The Northeast Conference is bringing its season tip-off festivities back to Brooklyn, and you can win a VIP pass that will put you in the middle of the action on October 22 at Barclays Center. The only other requirements for a chance to win your way to Brooklyn are an Instagram account and a little bit of creativity. Those interested in winning must make an Instagram video (15 seconds or less) in which they show their #NECpride and give a reason why they should receive a VIP invitation to “Social” Media Day. Beginning Friday September 27, fans may enter the contest by posting their Instagram videos using the hashtag #NECinNYC. You MUST include the hashtag to be eligible and it’s also probably a good idea to wear some school apparel in the video. All submissions must be posted on Instagram by Sunday, October 6. From that pool, the NEC staff will hand pick up to 10 finalists who will advance to the voting round. Voting will commence on October 7 and run through October 10. The entry with the most votes will win the NEC Basketball “Social”Media Day Grand Prize Pack. Complete details are listed below. Now get to work, and maybe we’ll see you in Brooklyn. 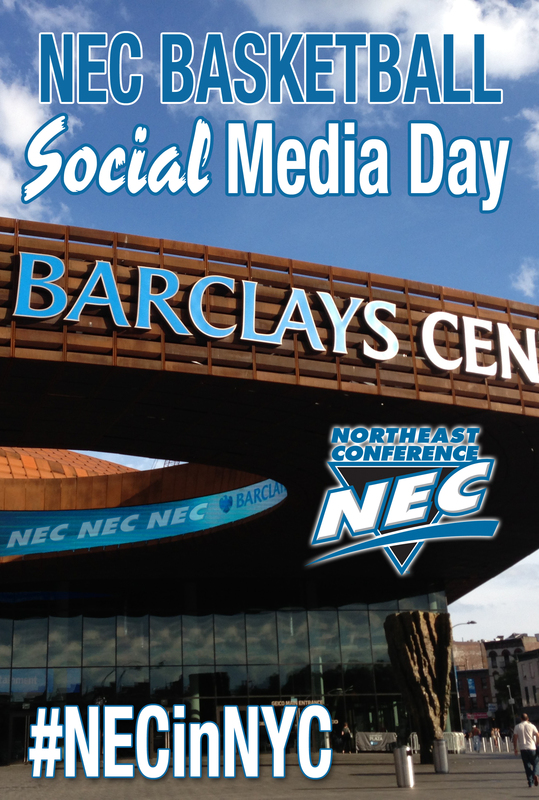 – Complimentary admission for two to attend NEC Basketball Social Media Day at Barclays Center in Brooklyn. – NEC apparel prize pack. – $200 Visa gift card. – Four tickets to any NEC regular season game. – Brooklyn’s own Junior’s Cheesecake Gift Certificate. – Meet and greet/pic with favorite coach/player. – Winner interviewed on NEC Front Row broadcast. – Fans submit an Instagram video (15 seconds or shorter) that captures their #NECPride/pride in their school and why they deserve to attend Media Day. – To be eligible video sumbissions MUST use the #NECinNYC hashtag. – Instagram photos are not eligible to win. – Instagram users with “private” profiles will not be able to submit. – All entries must be submitted by Sunday, October 6. – Fan voting will begin on October 7 and end at midnight on October 10. – The best entries (up to ten) as determined by the NEC staff will be displayed on the NEC website. A direct link to the contest page will be provided once the voting period begins. – Fans who wish to vote MUST be logged in to Instagram. – After watching the videos, mouse over the Instagram logo above the video you wish to vote for. Click on the “View on Instagram” button, which will take you to the native Instagram link for the video. There click on the red heart to like the video. – The video that receives the most likes will be declared the winner. – The NEC will notify the grand prize winner by commenting on the winning video and providing a contact number to begin making arrangements. LIU Brooklyn volleyball has won seven NEC Tournament titles in the past nine years. German-born Martina Wagner was there for the beginning stages of the unprecedented run. Having transferred from Georgia (the SEC school, not the country), the outside hitter joined the Blackbirds in 2005 and helped the team to another conference crown. Wagner was a huge piece of LIU’s win over Cornell in the NCAA Tournament that year. She racked up 18 kills and made 15 digs in a three-game sweep of the Big Red. In 2006, Wagner (the student-athlete, not the school) won the NEC Player of the Year award and captured the NEC Tournament MVP honor as the Blackbirds earned another league championship title. In all, the Pride of Friedrichshafen, Germany earned three All-NEC First Team selections along with three NEC championship rings. The three-time All-NEC first team outside hitter scores a point in a 2005 match against GWU at Georgia Tech. They all count, but when Wagner hosts Bryant in Week 5, the games will begin to count a little more. Staten Island, home of the defending league champions, will provide the backdrop for the first Northeast Conference game on the 2013 season slate. The Seahawks and Bulldogs will contest the lone league game on the Week 5 docket, and will do so before a national audience on ESPN3 beginning at 1:00 pm on September 28. 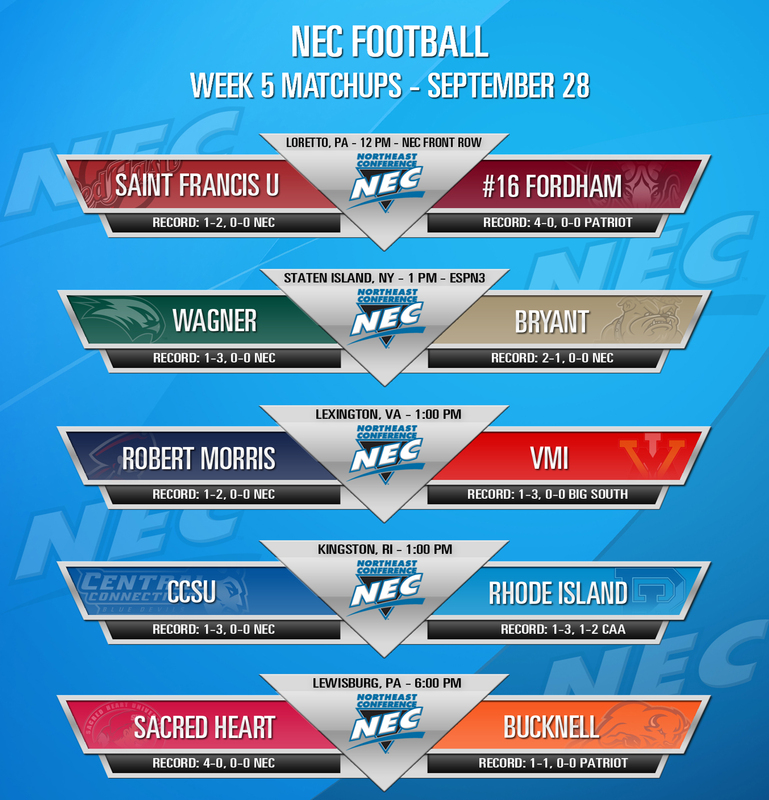 The game kicks off the NEC’s five-game ESPN3 on-air package, which will feature every conference member at least once. The start of conference play provides Wagner, Bryant and all seven NEC members the opportunity for a fresh start. Regardless of what transpires during out-of-conference competition, the NEC will award its automatic bid to the FCS playoffs to the team that performs best during league play. Currently mired in a three-game losing streak, Wagner, which was tabbed as the NEC’s “team to beat” by the preseason coaches’ poll, may welcome the opportunity to begin working on a clean slate. The Seahawks likely wouldn’t mind a repeat of 2012 when they opened with three consecutive losses followed by nine straight victories. Bryant, which was tabbed third in the preseason predicted order-of-finish, should enter Saturday’s Northeast Conference opener a bit fresher than Wagner. The Bulldogs were idle during Week 4, while Wagner suffered a 49-9 setback at CAA member Delaware. Viewers following the game on ESPN3 or via the Watch ESPN app will see two of the nation’s top offensive playmakers. Bryant senior Jordan Harris, a Walter Payton Award hopeful, is the active leading receiver in all of Division I FCS with 3,082 yards. The 6-foot-2 Harris, who is coming off a 9-catch, 182-yard performance at Maine in Week 3, needs only three more grabs to pass current Dallas Cowboy Miles Austin (150 receptions) for ninth place on the NEC’s all-time receptions list. Harris is only 383 yards away from owning the league’s all-time receiving yardage mark. Wagner senior Dominique Williams, who earned Preseason All-America honors from College Sports Journal, logged his 23rd career 100-yard rushing day in the loss at Delaware. The all-NEC running back (3,739) ranks fifth amongst Division I FCS active leaders in career rush yards. Following the Week 5 matchup at Wagner, the NEC’s on-air package will continue in Week 6 at Central Connecticut where the Blue Devils will host Saint Francis on October 5 at 1:00 pm. You think Mike Westerhaus is ready for Bryant’s NEC opener? It was a good week to belong to the NEC’s Nutmeg State contingent. Central Connecticut broke into the win column with a last-minute victory at CAA member UAlbany and intra-state rival Sacred Heart moved to 4-0 on the season by piling up a program-record 78 points. CCSU joined Duquesne as NEC teams who have beaten former league rival Albany this season. The Blue Devils put together a complete effort to pull out the road win. Linebacker Chuck Watson made 15 tackles to lead a defensive effort that limited the Great Danes rushing offensive to 2.8 yards per carry. Steve Calitri coolly kicked the longest field goal of his collegiate career to break a 17-17 tie with 00:17 remaining. And preseason All-American all-purpose runner Rob Hollomon had his usual day at the office – 205 yards from scrimmage, including 41 on the game-winning drive. Central will have a chance to post another win over a CAA member in Week 5 when it visits Rhode Island. Visiting Chowan, a Division II member, stunned the Homecoming crowd at Campus Field by jumping out to a 14-0 lead over Sacred Heart before the Pioneers exploded with one of the top offensive performances in the program’s history. By the end of the first quarter, SHU held a 22-14 lead and was on its way to a romp. The Pioneers’ defense was almost as effective at scoring points as the offense. Sacred Heart scored three defensive touchdowns and nearly had two others. The wet weather in Loretto was not nearly enough to put a damper on Saint Francis 2013 home opener. Like Sacred Heart, Saint Francis also out-classed a Division II opponent in Week 4. The Red Flash blasted Lincoln 38-7 behind a 230-yard rushing day from running back Kyle Harbridge. The performance moved Harbridge within 445 yards of becoming Saint Francis’ all-time leading rusher. After a solid effort at nationally-ranked James Madison in Week 3, the SFU defense was stifling as it limited Lincoln to a total of 91 yards. Duquesne and Wagner both suffered road losses to teams from FCS power conferences. The Dukes fell at Youngstown State despite a 362-yard passing day from rookie QB Dillon Buechel, while Wagner wasn’t able to get going at Delaware. After being limited to only 34 yards at Syracuse in Week 3, Wagner running back Dom Williams bounced back (as we expected him to) by rushing for 120 yards against the Blue Hens. Duquesne will be idle in Week 5, but Wagner will have a chance to get the sour taste out of its mouth. The Seahawks open Northeast Conference play at home against Bryant in a game that can be seen live on ESPN3 and via the WatchESPN app. Wagner and Bryant will play the first conference contest of the season and the lone league game on the Week 5 slate. No better feeling than watching the guys get the W today. Enjoy it tonight and than we move forward. 1-0 this week. So is this @G_Hill28 pick 6 I keep hearing about going to be on sportscenter or what???? In sports all you can control is effort. Not the weather, the refs, or anyone else. All you can control is you and how hard you work.